goes for $60+ on Amazon nowadays. 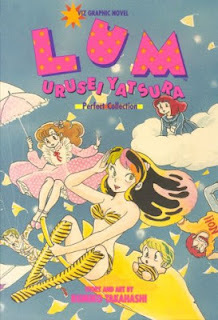 About ten years ago I picked up a manga called Lum: Urusei Yatsura as reading material in a comic shop while on a trip to Halifax. It was literally the best deal on the shelf (back in the day when Japanese comics were not even 1/10th as mainstream as they are now! ); 400 pages for $15 dollars. We were in for a long ride back to St. John's, so it was perfect. I remember not being sold on Lum at the time. It was a little too wacky for me, and the "collection" nature of the book made it hard to follow at times. Still, as I was going through my photos from orientation to post on Tadaimatte, I remembered something that made me smile: on my first day in Osaka, while staying at the Dotonbori Hotel, the only thing on television that night was Urusei Yatsura. I walked in halfway through, so I didn't really get what was going on, but it was a relief to me to find something familiar to watch once it became too late to go outside in the unfamiliar city. The movie was Only You - you can check out the trailer below. While I was thinking back to that, I decided to give Urusei Yatsura another try by watching the films, and over the past week or two have been doing that and finding that I'm enjoying the series considerably more. I'd developed a distinct taste for Takahashi Rumiko's vintage collections long ago (Maison Ikkoku is my favourite manga) and while Urusei Yatsura is not her best work, it is still funny and lighthearted. It does contain many of the elements that I love about Ikkoku, a series that came a short while later, and clearly after learning a few lessons about the direction she wanted to take her work. I know many people enjoyed the more well-known Inuyasha, but in my opinion, 'slice of life' stories are what Takahashi Rumiko does best. I'd definitely like to see her return to this sort of project someday.